As the weather becomes colder and winter begins, it’s important to winterize your home’s plumbing if you’re leaving town for an extended amount of time (or house is vacant). Plumbing winterization helps to prevent your pipes from freezing and bursting, which can cause devastating water damage and costly repairs. When temperatures drop and water freezes within a pipe where a faucet is closed, pressure builds and water can end up bursting through your pipe walls. Check your outside faucets for drips and leaks and have them repaired as needed. Shut off exterior valves. Turn off the water supply inside your house and drain water by opening up the exterior faucet. Drain water from outside lines, as well. Make sure your water heater is operating properly, as it works harder in the winter. The ideal temperature setting is 120 degrees. Insulate pipes in unheated spaces, like the garage, attic, and crawlspaces. Any pipes that are exposed should be insulated to prevent freezing. Disconnect outside water hoses, which can freeze and cause connecting pipes to freeze or break in your home. Check for air leaks from windows and doors. Any cold air that may blow on a pipe or fixture increases the risk of freezing. Sealing air leaks also helps to reduce energy costs on heating your home. 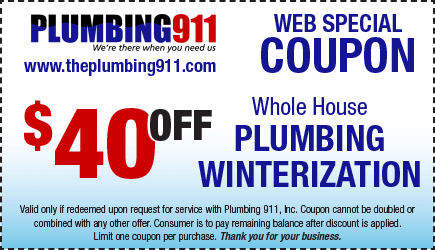 Winterizing your plumbing is one step you can take to prepare your home for winter. Plumbing 911 can help get your home ready for cold weather while making sure that your plumbing system is in good shape and working properly. This way, you can have adequately running water, and hot water, all winter long while you stay warm and comfortable inside your home.